With about 100 million Americans heading to the polls today, the ABC News Ballot Watch Team is tracking possible voting problems and irregularities across the country. Donald Trump has repeatedly called the election "rigged" and warned of widespread voter fraud, while Democrats have brought lawsuits alleging illegal voter intimidation and suppression in Pennsylvania, New Jersey, Michigan, Ohio, Nevada, Arizona and North Carolina. But election authorities in all 50 states told ABC News they have confidence in their voting systems. In every national election there are scattered reports of long lines, voting machine malfunctions, ballot shortages, misinformation campaigns and Election Day lawsuits. ABC News is tracking such reports to determine whether they affect voters' rights or election results. Election Protection, a group that describes itself as a nonpartisan voter protection coalition, held a media briefing in Washington, D.C., this morning to announce an uptick in the number of calls to its national hotline alleging voter intimidation and harassment. The group said it has heard from 80,000 voters so far on a wide range of election-related issues and expects to receive some 175,000 reports by end of day. Several reported incidents of voter intimidation were flagged in Florida this morning, according to Election Protection. In Broward County a group was accused of intimidating at least one voter outside a Hollywood public library. But this report appears to have been erroneous. "What we understand is there were a group of individuals aggressively assembled outside [the polling place]," said Kristen Clarke, the president and executive director of Lawyers' Committee for Civil Rights Under Law, part of the coalition. "They were approaching vehicles. In one instance, they touched a woman's car. She did not feel free to park her car and cast her ballot and left without doing so." 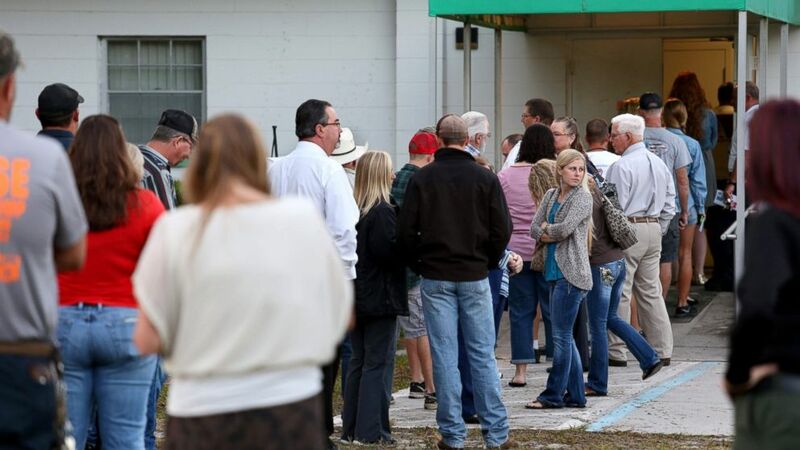 Voters wait in a queue to cast their ballots in the presidential election at a polling station in Christmas, Florida, Nov. 8, 2016. But later, in an interview with ABC News, Clarke said she was unsure of the timing of the alleged incident at the library and said it might have occurred during early voting, which ended on Sunday. ABC News has learned this library was an early voting location, not a polling place. People showed up thinking they could vote there and became confused when they were told they couldn't. It was a misunderstanding but reportedly not intimidation. In Jacksonville, according to Election Protection, a female Republican poll watcher was intimidating voters by getting too close to them as they filled out their ballots at a polling place in the St. Paul AME Church, in a majority black section of the city. A Democratic poll watcher complained to the clerk at the precinct, but the woman refused to leave. She finally left after a Republican poll worker spoke with her. When ABC News called the church, no one could confirm the incident occurred. There were reports of police officers appearing at polls in Missouri — which the Advancement Project, part of the Election Protection coalition, thought might have a chilling effect on minority voters. Greene County reported it would have a sheriff's presence at polls. While there have been no reports yet of officers in that area, there have been reports of a police presence at a polling place in St. Louis that Election Protection was able to disperse. The North Carolina State Board of Elections passed a motion to extend voting by 60 minutes in two Durham County precincts. Earlier in the day a number of Durham precincts had technical issues with their electronic poll books, which are used to check in voters at the polling place. For the sake of uniformity, Durham County requested a 90-minute extension for all eight precincts that experienced interruptions in voting. Voting was extended in six other Durham County precincts by the exact amount of time that they were delayed, ranging from 20 minutes to 45 minutes. The state board voted 3-2, with dissenters arguing that the state should grant the two counties where voting was extended by 60 minutes on top of the delay times. Those who voted in favor said they did not want to force workers to stay into the night and didn't want to hold up the entire state process because of on one or two precincts. The state is authorized to extend voting only by the same amount of time or less that a polling place is interrupted, according to state statute. The polls close at 7:30 Eastern time in North Carolina. The board voted to keep the polls open a half-hour later in one Columbus County precinct. Earlier, Election Protection reported receiving calls about voting machine malfunctions in North Carolina, with the most widespread reports in Durham County. Willa Domina, 6, watches her mother, Emily Katz, vote at a polling station, Nov. 8, 2016, in Durham, North Carolina. But a representative for the North Carolina State Board of Elections clarified to ABC News that while there have been no issues with voting machines, Durham County experienced technical problems with the electronic poll books used to sign in voters at polling places. Issues occurred in five precincts. As a precautionary measure, the Board of Elections directed the entire county to revert to paper poll books, the representative said. A state judge today denied a request by the Trump campaign to issue a court order requiring state officials to preserve and segregate ballots in areas where the campaign alleges violations of Nevada voter laws occurred, according to court filings. The ruling comes in response to a Trump campaign lawsuit alleging that Joe P. Gloria, the Clark County registrar of voters, violated election laws during early voting. The Trump campaign claimed that Gloria kept the Cardenas Market polling place open after the published closing time and improperly allowed approximately 300 voters to cast nonprovisional ballots after hours. Also, it claimed he held three other polling places open late in disproportionately Democratic areas. Voters are greeted at Cheyenne High School as they arrive to cast their ballots on Election Day, Nov. 8, 2016, in North Las Vegas, Nevada. Finally, the Trump campaign claimed that "Democratic operatives brazenly handed out, to voters standing in line within the 100 foot radius of the Cardenas Market polling place, electioneering literature listing and recommending the Clark County Democratic Party's favored candidates," according to the court filings. "Today the judge denied the petition from the Trump campaign, and pointed out that what they were seeking was already required by law," reads a statement on the official Facebook page of Clark County. The Trump campaign did not immediately respond to ABC News. The Clinton campaign praised the judge's dismissal of what the attempt. 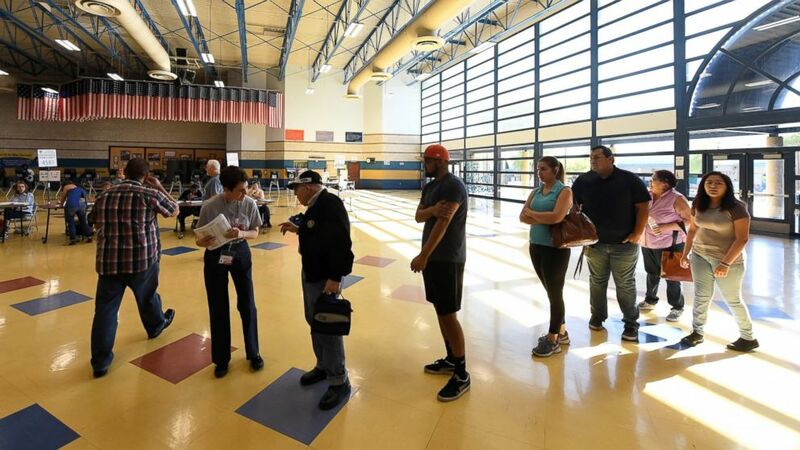 "We're pleased the judge swiftly denied what was a frivolous attempt to disenfranchise voters in Clark County and a desperate response to the record turnout we're seeing in Nevada and across the country," said Glen Caplin, a Clinton campaign spokesman. "Every voice needs to be heard in this election, and both campaigns should be working to ensure that every American will have easy access to the ballot box." The lawsuit came days after the Trump campaign filed an election integrity violation report with the Nevada Secretary of State's Office over the same matter. The Republican mayor of Mansfield sparked swift backlash on social media when he reportedly tweeted, "Democrats vote on Wednesday, 11/9." His office confirmed that the tweet has been taken down but did not provide further information. He did not respond to ABC's email request for comment, and his office said he was "out of town" and unavailable to speak. He told The Atlanta Journal-Constitution that it was a "joke." "People take things so seriously," he told the paper. The Republican Party of Pennsylvania has made numerous claims throughout the day of machine vote flipping, intimidation of Republican poll watchers and voters and illegal campaigning in polling places. It has not filed any lawsuits yet, but state party spokeswoman Megan Sweeney told ABC News that it still may. • A credentialed poll watcher observed a voting machine that had registered votes before the polls' opening this morning. "When the poll watcher brought the machine issue to the attention of the election judge, the judge turned violent, pushing the poll watcher and then forcibly removing the poll watcher from the polling place," DeFelice said. • A poll watcher witnessed "significant voter intimidation by a Democrat committeeman, including segregating voters into different lines, depending on their party affiliation – an attempt to shame Republicans and specifically black Republicans in a heavily Democratic and black ward," DeFelice said. Also, this committeeman tampered with provisional ballots and illegally distributed Democratic campaign literature in a polling place, he said. 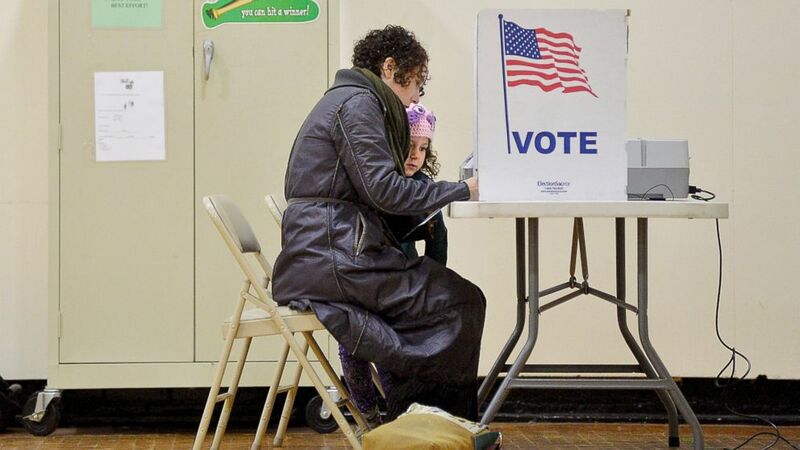 • The Philadelphia Republican Party has received scores of complaints throughout the day of credentialed poll watchers and inspectors "being removed and sometimes forcibly ejected from polling places throughout the city," he said. Cameron Kline, a spokesman for the Philadelphia district attorney's election fraud task force, told ABC News it has fielded 95 election-related calls today but has made no arrests. "This is very typical of a presidential election," he said. "Nothing out of the ordinary, and we're not anticipating any issues." In 2012 it received 97 calls by the same time, he added, so "we are on point in terms of number of calls." The Pennsylvania secretary of state denied Republican claims of unusual Election Day problems. "There have been very few actual problems, no more than we have seen in any recent presidential elections," wrote spokeswoman Wanda Murren. She said that only about 25 machines out of 25,000 machines statewide malfunctioned and that "it appears that no votes were cast inaccurately and no voters were disenfranchised." She said the malfunctions arose from calibration problems and in each case the voting machine's confirmation screen flagged the votes that needed to be corrected. Meanwhile, a Pennsylvania judge denied a request from the Clinton campaign to keep polls open late in three Philadelphia precincts because of a late start. ABC News' Lauren Pearle, James Hill, John Kruzel, Geneva Sands, Jessica Puckett, Teri Whitcraft, Mike Levine and Eva Pilgrim contributed to this story.